Hymnplicity Ward Choir - Book 1 by Various. Arranged by Brent Jorgensen. For Choir. Choral. Medium Easy / Medium (accompaniment). Hymn Extender. Published by Jackman Music Corporation (JK.00997). 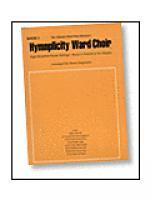 Here is the perfect answer to a tight ward choir budget. Quickly prepare beautiful choral arrangments of hymns using the resources found in this book combined with the 1985 edition of the LDS hymn book. Simple "Road Map" pages, which may be photocopied, instruct the choir's use of the hymn book. Conductor and the pianist work directly from the score. Hymns included in this volume are: "Abide With Me" "As I Search the Holy Scriptures" "I Need Thee Every Hour" "Lead Kindly Light" "Let the Holy Spirit Guide" "More Holiness Give Me" "Nearer My God to Thee" "Sweet Hour of Prayer".